Aikatsu! – 13 | Mezashite! I wish she’d eat my adult chocolate. Aaand we’re back to our first series after a two week long break. Is it just me or are things starting to get serious? I’m obviously referring to how evil Otome-chan is and how much of an enabler she’s being. Anyway, enjoy your fat moe. Uh, I mean, thanks. We aim to please. Just wondering, was there no Aikatsu Aphorism this week? The time it would normally play in was used to broadcast an announcement for a joint promotion between Aikatsu and Tamagotchi. Hopefully it’ll be back next week. You could also ask Suzuko from 0048 about her opinion of “unique” body-types. I will respond to your senseless comment by saying Happy Birthday to Kanako Mimura. So fast! It must exist at YT now (I don’t download torrents T_T). By the way, konbanwa! 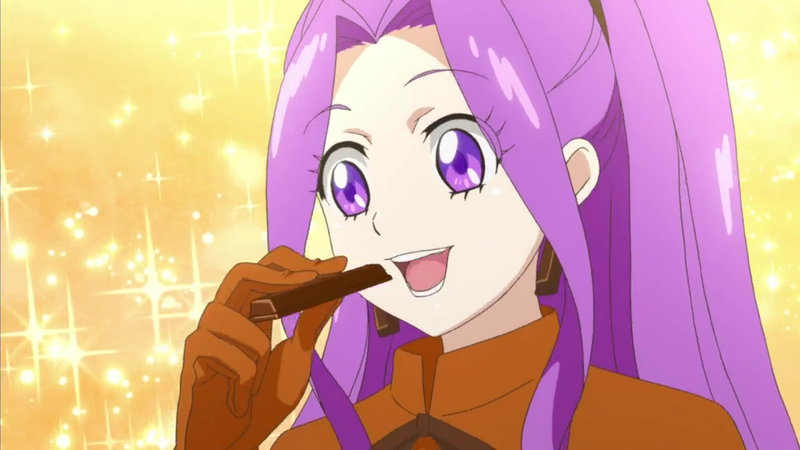 I’m Abby aka LyokonoKawaiiPurinsesu(don’t ask why I put “kawaii” :v) from Aikatsu! Wikia (http://aikatsu.wikia.com/wiki/Aikatsu_Wiki), I’m really need help for doing the cardlist(my friend’s style: it kills me!! ;A;), I’ll very helped if you can team up with us, if you don’t want to, I really thanked for your respond. Are you going to sub Hamtaro or Tamagotchi? We’re sticking to just Aikatsu and Oreshura, one series per TL/group member.